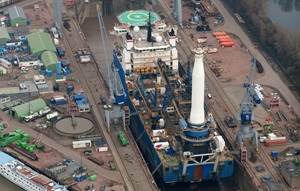 After having successfully performed the life-time extension works on the Stanislav Yudin (owned and operated by Seaway Heavy Lifting), in 2013-2014 at Damen Shiprepair Rotterdam (DSR), part of Damen Shiprepair & Conversion, a new significant contract is awarded by Technip, for dry-docking, upgrades and operational modifications to the deepwater rigid pipe S-lay and heavy lift vessel, the Global 1200. The vessel arrived at the yard in January 2015. The Global 1200 is the first of two deepwater rigid pipe S-lay and heavy lift vessels owned by Technip. The vessel was designed by Ulstein Sea of Solutions (SoS) of the Netherlands and built by Singapore-based Keppel Singmarine. Ruud Haneveer, Commercial Manager Offshore & Conversion explains the scope of work; “The major upgrade works are divided into 3 packages; (i) dry-docking for Special Periodical Survey and various maintenance repair works, (ii) modifications to upgrade the vessel DP capability, and (iii) various pipelay equipment upgrades for future projects.